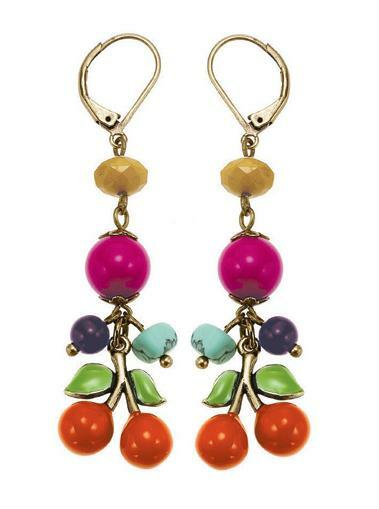 This colourful and fruity series will add a subtle splash of summer colour to your life. It combines small fruit metal charms in vibrant enamels, fabric covered beads, metal filigree, wood and paste beads and millefiori glass hearts. Burnished gold plate. 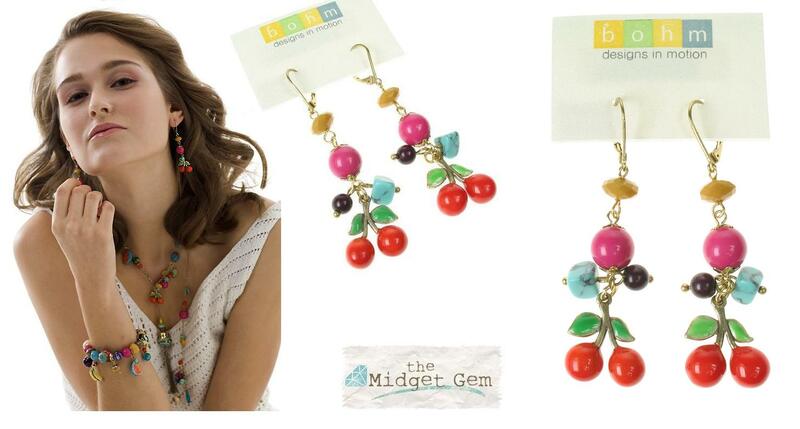 The Bohm pretty 'Cherry' earrings. Enamelled charms. Faceted beads. Turquoise tablets. Burnished gold plate. Vibrant colours: turquoise, cerise, purple, green and red. French clip fastener for pierced ears. Beads/charms measure from 5mm up to 2cm/20mm. Total length 6.5 cm/65 mm. 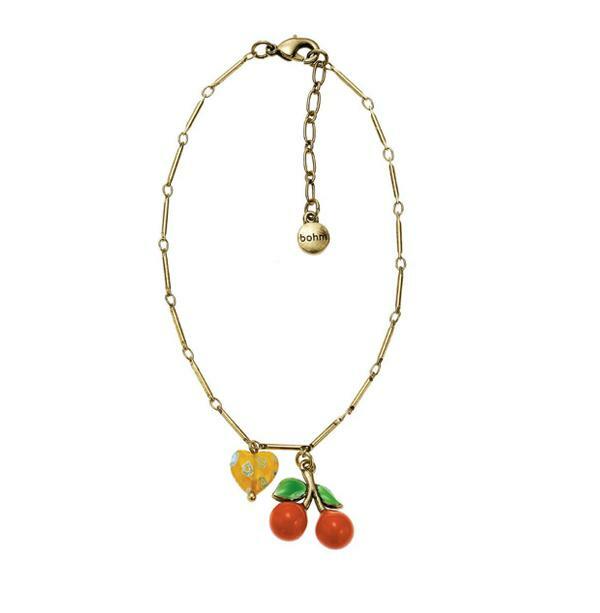 The Bohm adjustable fruity charm bracelet. An array of different mediums are used: enamelled fruit charms, fabric covered beads, millefiori glass, filigree, wood, paste and turquoise beads. Burnished gold plate. Beads measure 5mm to 2.5cm/25mm. Adjustable length 19cm/7 inches up to 23cm/9.5 inches. 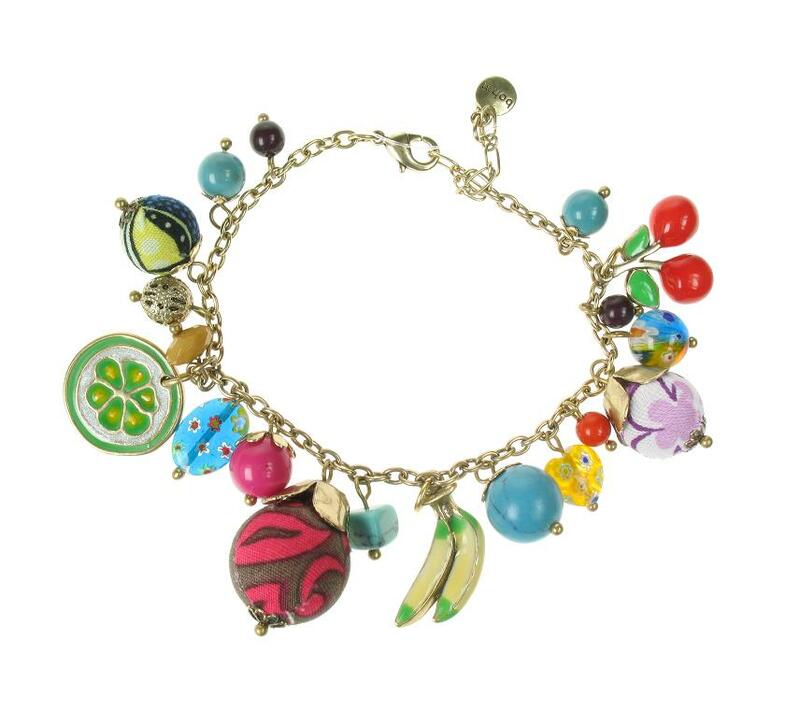 The Bohm fruity stretch charm bracelet. 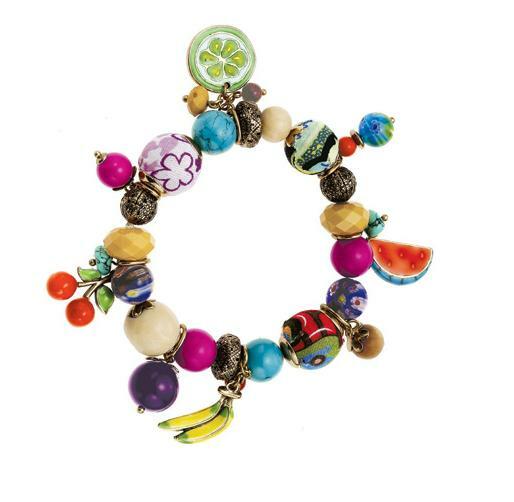 This pretty bracelet combines an array of different mediums including: enamelled fruit charms, fabric covered beads, millefiori glass, filigree, wood, paste and turquoise beads. Burnished gold plate. Beads measure 5mm to 2cm/20mm. It stretches to fit all wrists comfortably. Unstretched measures 18cm/7 inches. 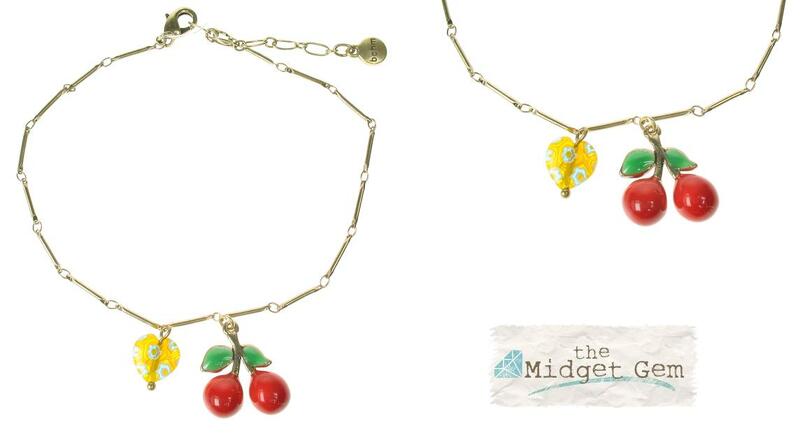 The Bohm 'cherries' charm anklet/ankle chain. Enamel and yellow millefiori glass heart embellished ankle chain/anklet. Adjustable length 22cm/8.75 inches up to 26cm/10.25 inches. 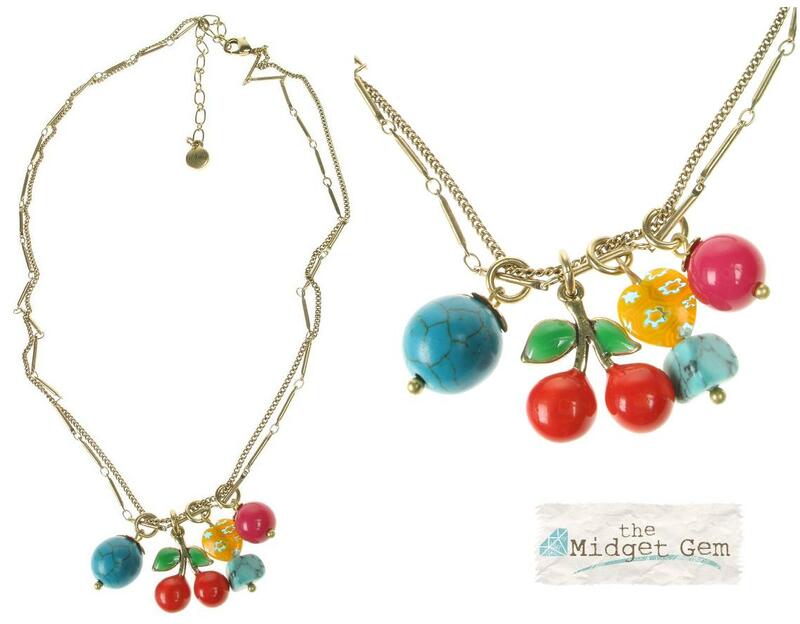 The cherry charm measures 2.2cm/22mm. Burnished gold plate. 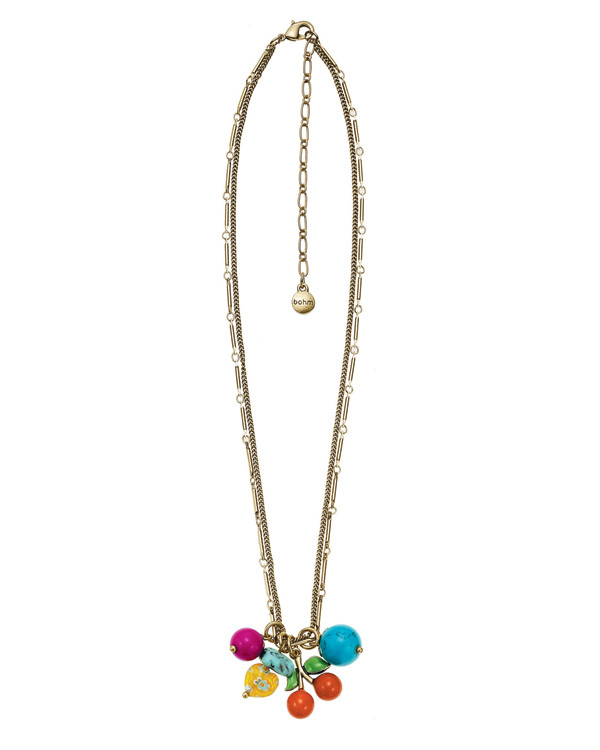 The Bohm 'cherries' charm necklace. Multi-strand chain. Yellow millefiori glass heart, enamel cherries, cerise paste and turquoise beads. Beads measure from approx. 8mm up to 2cm/20mm. Burnished gold plate. Adjustable chain 41cm/16 inches to 49cm/19 inches.